Many animals, birds, and even bacteria align themselves with the Earth’s magnetic field when they need to navigate. Inner Earth is where our magnetic field originates. At the heart of the Earth is its solid inner core, made up of iron and perhaps some nickel. It’s about the size of Pluto and lies about as far from our feet as Los Angeles is from New York. And it’s about as hot as the surface of the sun. Artist’s rendering, inner Earth, courtesy of NASA.gov. Surrounding it is a 1200-mile-thick layer of molten iron and nickel. It’s hotter at the bottom than at the top, and so there is convection within the molten layer. The convection moves electrons, and this creates electric currents that together generate the magnetic field. And we’re very lucky to have a magnetic field. It works like an invisible force field that extends miles out from Earth into space and shields us from solar winds. Those winds come at Earth at a speed of 560 miles a second, and the particles in them are 1.8 million degrees Fahrenheit. They would easily destroy our atmosphere and make life on Earth impossible. People in Canada and the northern United States often have the pleasure of watching the magnetic field do it’s heroic deed. The aurora borealis—also called the northern lights—is the firework-like display of particles from the sun getting bounced back into space. Do all planets have a magnetic field? Not all planets have a metal core and so not all planets have magnetic fields. Mars doesn’t—which may be one of the reasons it has no surface life that we know of. Though it’s theoretically possible that Mars has life underground. Earth has lots of it. They are microbes. Scientists refer to them as “extremophiles” because they’ve been found in extreme environments like volcanic vents at the bottom of the ocean. 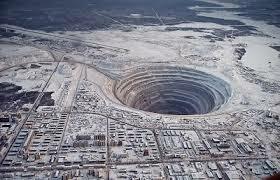 Some have been discovered in the cavities and cracks of goldmines as much as 3 miles beneath Earth’s surface. And this isn’t a rare phenomenon. Microbiologist James Holden of the University of Massachusetts believes that as much as 1/3 of life on Earth is life UNDER earth. How deeply have humans explored the inner Earth? The deepest place ever reached by human technology is really only skin deep, Earth-wise. It’s the Soviets’ Superdeep Borehole on a peninsula near Finland. It reaches almost 8 miles down—far, but not really far. They started to drill it in 1970. After 22 years they had to stop because the rock that far down is so hot that, when drilled, it turns to goo rather than give way. In 1962 Edmund Halley (of comet fame) proposed that Earth is hollow—and inhabited? In the 1940s there was a rumor that Adolf Hitler had escaped Germany and had flown in a space ship into the inner Earth through one of its poles. He was said to be living luxuiously there in exile. No one has ever taken its temperature, but most geoscientists believe that Earth’s core is as hot as the surface of the sun. At the boundary between Earth’s outer core and its mantle (the layer that is essentially all hot lava) it’s a thousand degrees cooler than at the core. There, oxygen, silicone and sulphur collect into yellow-hot slush dunes. Every once in a geologic while one violently tumbles into Earth’s mantle, revving up convection and disturbing the entire Earth’s magnetic field.